Welcome to Jets Gymnastics, established in 1991. Jets Gymnastics offers classes from pre-school to competitive levels (Including USAG, JOGA and TNT). We encourage every child to progress at their own pace. Located right off exit 36A of I-295 in Mount Laurel, Jets is only a short drive from Marlton, Cherry Hill, Maple Shade, Voorhees, Hainesport, Moorestown and surrounding areas. Jets is a 10,000 square foot facility. 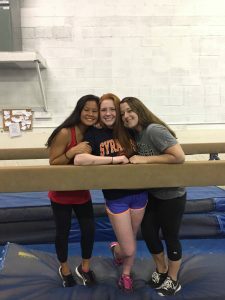 Our facility has all four women’s Olympic events (vault, uneven bars, beam, and floor), traditional trampoline, competitive trampoline, tumble track, and a foam pit. The gym is air-conditioned in the summer. Jets is cleaned and inspected daily for customer safety. The gymnasium is fully visible from our glass enclosed lobby. Family and friends are welcome to come and watch whenever they would like. Toys and DVD’s are available for siblings. Our pro-shop is restocked monthly where leotards, shorts, T-shirts, and other equipment can be purchased. Chelsea Cronin – Gym Owner, JOGA and USAG Coach.